Unless you’ve been living under a rock for the last year, you’ll know there’s been significant investment ploughed into Eldon Square’s ‘Grey’s Quarter’ – two (and a bit!) storeys of restaurants, predominantly large chains, providing enough variety to suit your every foodie desire. I’ve mostly avoided it so far, due to the Christmas rush, but we had heard great things about the newly-opened George’s Great British Kitchen, so ventured into town for a lazy, boozy lunch on a rare day off work. 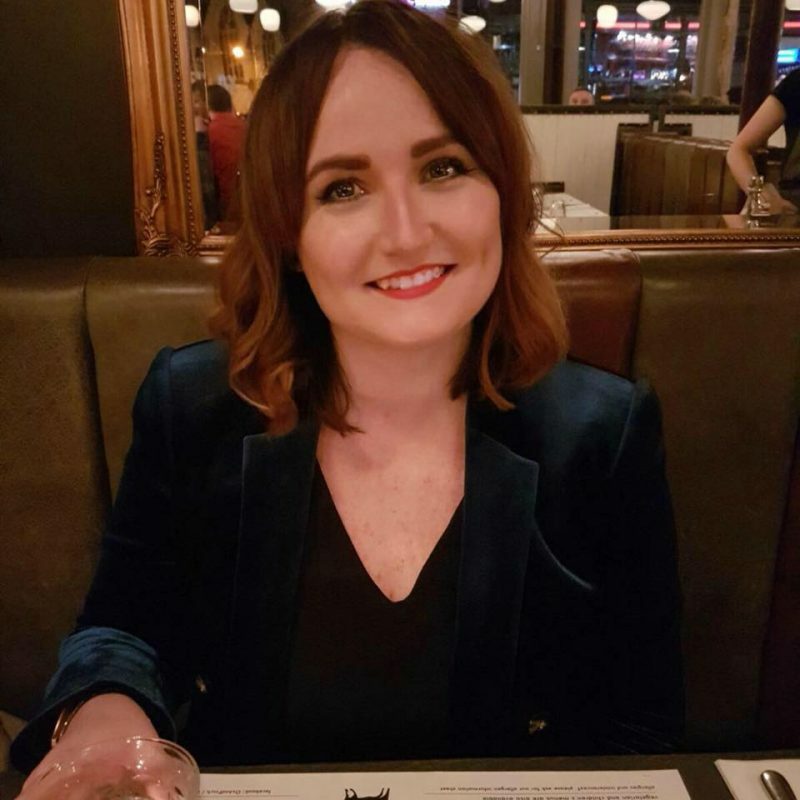 Now there’s a lot of snobbery – within the blogging community especially – when it comes to chain restaurants, so before I get into how good the food was, I just want to put my two pennies in. 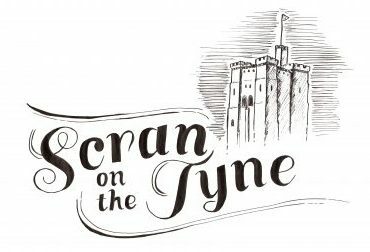 For decades, Newcastle was the forgotten corner of the map, with few national brands daring to head up the A1 to set up shop here. We were hardly a culinary destination, but over the last ten years or so, that all changed. I have absolutely no beef with chains. There, I said it. These businesses invest into our area, clean up our once-dour shopping malls and most importantly, provide opportunities for the people in our region. Sure, they’re not completely “independent” (whatever your definition of that is! ), but so what? I wholeheartedly support our independent restaurants, but sometimes, I just fancy a Nando’s. Sue me. There’ll be no snobbery on this blog when it comes to chains who are delivering tasty food at a reasonable price – and variety, after all, is the spice of life. The Newcastle restaurant is actually only the second in the George’s empire, so a relatively new “chain”, if you insist on calling it that. The restaurant is situated at the Clayton Street end of Eldon Square, and the first thing you see is their cute little indoor garden area and their huge light-up sign. Our visit was on a Friday afternoon amongst a sea of Christmas shoppers, so it was pretty packed, but we managed to walk in and get a table for two. The interior of the restaurant is quirky and very well finished. In some areas it kind of reminded me of an old-school ice cream parlour, with marble and brass finishings dotted everywhere. Then there’s the beach hut tables (GUTTED we didn’t get one of those bad boys!) and huge chandeliers and lots of colour. It’s really very pretty. 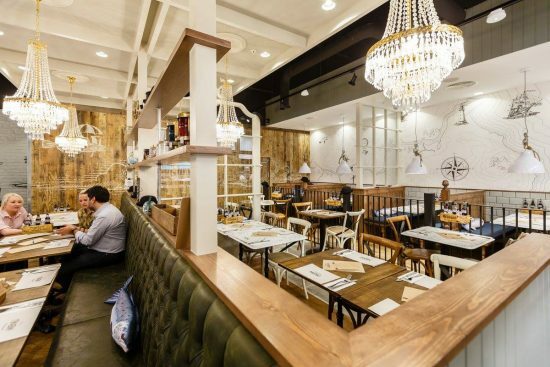 The company has won accolades for their restaurant design, and it’s not hard to see why. We were seated in the outside-inside *heated* garden, which was a little on the noisy side, but aesthetically rather pleasing. Think beach umbrellas, astroturf and cute little picnic tables. They also supply little blankets in case you’re chilly, which is a nice touch. The designers have certainly ticked the box that reads ‘Quintessentially British seaside’ with success! Unfortunately, you have the problem of “nosy neighbours” walking past literally every 2 seconds and peering over the hedge, so there’s always someone gawping at you while you chow down on your food. Not ideal, but comes with the territory of a ‘garden’ in the middle of a shopping centre. Given our time again we would have opted to wait for a table inside, because if I’m honest, the seats outside aren’t too comfortable either and the tables are a little on the small side, especially when you consider how large their fish platters are. The service is super friendly. Like, American friendly. I always make a point of asking for recommendations, and our waitress was happy to share her views on both drinks and food. She failed to mention the portion size, mind you, but I’ll get to that bit later… I’m afraid I don’t remember her name, but she was very canny and attentive throughout our visit. I think I may recall she was Scottish, but who knows – I was too busy thinking about what we were going to order. Their drinks menu is packed with good quality cocktails made using British-brewed spirits, along with some of the usual suspects. I went for the ‘English Wild Garden’ (£8.50), a concoction of Brecon gin, creme de mure, apple juice, their home-made apple compote, shaken together with rosemary and cucumber. Very refreshing! 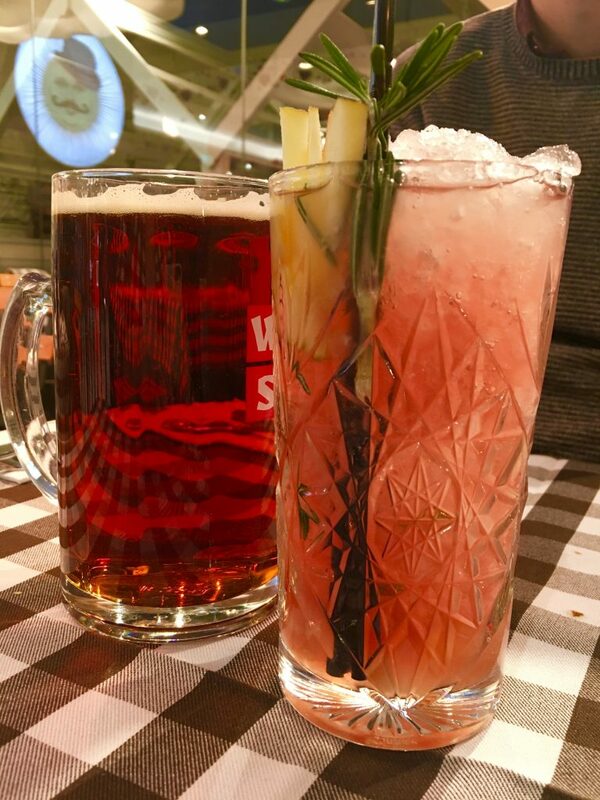 As with everywhere that’s super trendy, George’s Great British Kitchen makes quite the big deal about gin, so expect an array of tipples to choose from with more accompaniments than you can shake a sprig of rosemary at. 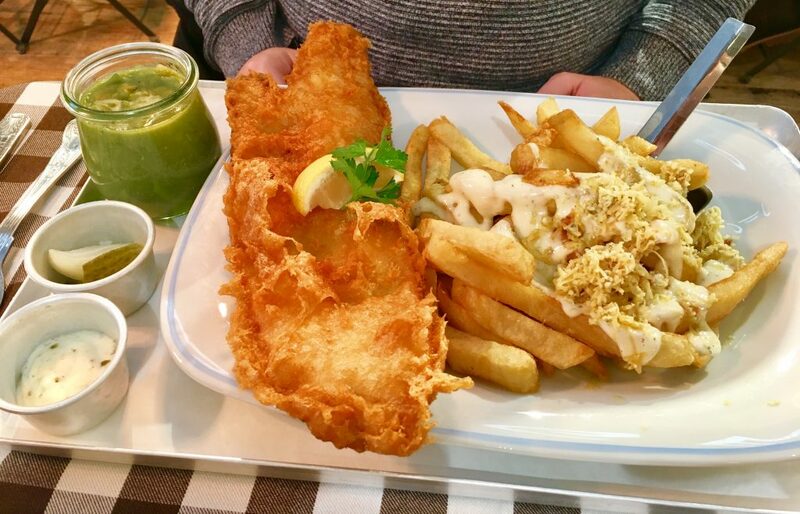 My boyfriend went for a pint of Crafty Seagull (£4.95) which was smooth and light – the perfect partner for the multitude of batter he was about to consume! To start, he opted for the George’s Scotch Egg (£5.95). 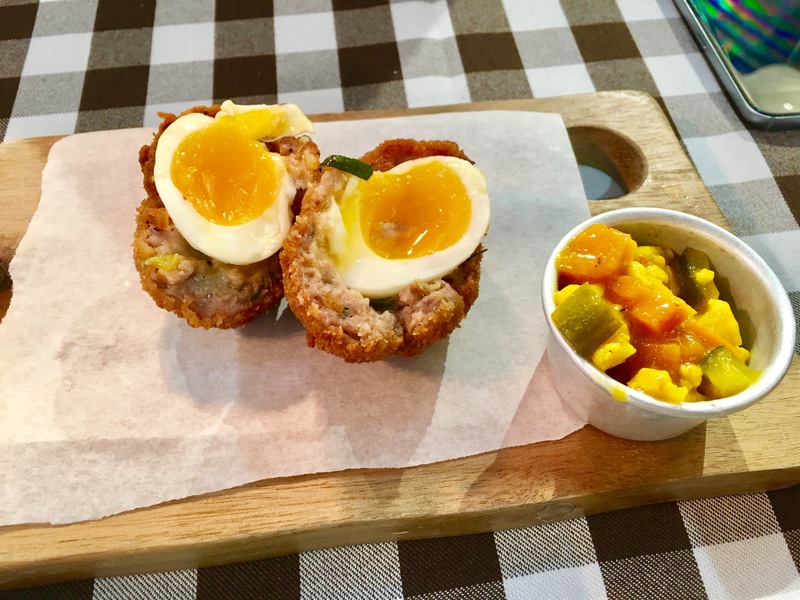 A scotch egg is always a good test of skill in the kitchen, and I’m pleased to report this one had a nice runny yolk, and the sausage meat was full of flavour thanks to the inclusion of ginger which gave it a little extra bite. The star of the show was their tangy and chunky piccalilli, which was seriously addictive. I went for the Katsu Chicken Goujons (£5.55) which were totally delicious. 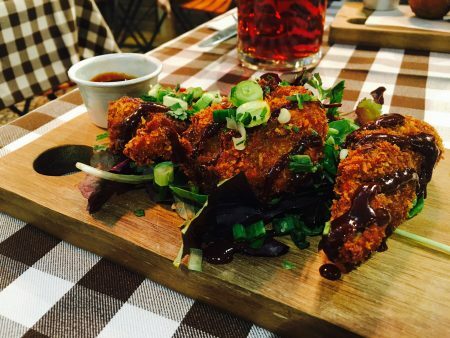 Crunchy mini-fillets of succulent chicken coated in a smoky-flavoured batter and lathered in a home-made Katsu curry sauce. This is a unique take on the classic Chip Shop curry sauce, and I’m a big fan. Piled on top was plenty of coriander and spring onions which added a much-needed dimension of freshness amongst that sweet curry sauce. 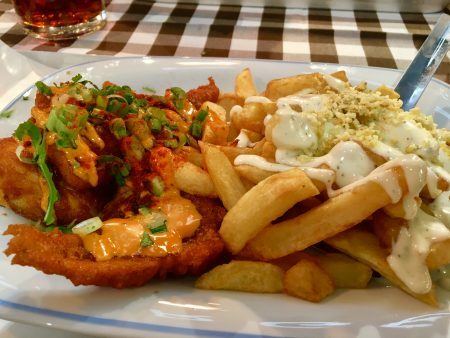 If we return to George’s Great British Kitchen, I’ll definitely be ordering this again. After a short wait, it was main course time, and our waitress brought out two MONSTER SIZED platters laden with err, far too much food after those starters! I’d opted for the Scottish Haddock in Paprika batter (£12.95) that was drizzled with chipotle mayonnaise, coriander and plenty of fresh chopped spring onion. In perhaps an ill-advised move, I’d also chosen the Stilton Chips (£2.75) to go with it, which were totally delicious, but after a while the combination got a bit sickly. In hindsight, I should have gone for the good old classic chips, but after hearing so much about the Stilton variety, I just had to. My boyfriend went for the classic: Wild Ocean Cod (£12.50), again with the stilton chips. The fish was fleshy and gloriously fresh, and the batter light but crunchy. His main course certainly paired better with the stilton chips, and he also had some chunky mushy peas, pickles and tartare sauce to enjoy with it. Should we visit George’s Great British Kitchen again, I’d opt for this main course. Proof that you just can’t quibble with a well-done classic of cod and chips. After ploughing through as much as we could, it was game over. I’d love to say I had room for dessert, but I could barely stand up after all of that food (and we didn’t even make that big a dent in it! ), so no chance. I did notice a few people enjoying the much-hyped ‘Famous Dessert Sharer’ which is bulging with doughnuts, various dipping sauces and candy floss. George’s has a knack of serving everything so beautifully that you think you’ve just gotta have it – and their desserts are a sight to behold. If you’re into sweet things, I suggest you save a little room. We’d pondered getting more drinks, but as the restaurant continued to fill up, service got a little more stretched and we headed on to the Botanist to continue the gin drinking. The bill at George’s came to a rather reasonable £62, and when you consider how much food we actually got – it’s not bad value at all. We both have quite impressive appetites, but I’ve got to admit, we were defeated for quite some time due to the sheer magnitude of food. Absolutely. I’d love to experience the buzz of the restaurant inside and I’m definitely keen to try out more of their cocktails, ideally now the Christmas rush has died down. One thing I definitely won’t be doing is ordering two courses, but that’s just me… if you’re keen for your fill of Great British classics, then you could really go to town at George’s! Avoid sitting outside, that would be my only advice to you, other than that, we had a rather splendid visit. Oh, and one more thing: George’s Great British Kitchen will be participating in NE1 Restaurant Week! You can find out more about their offer RIGHT HERE. Prior to visiting George’s, we were sent a £50 gift card to be redeemed at a time of our choosing. This was to be used against our final bill, however the restaurant had no idea when we were coming or who we were, so you be assured this review is true to experience. 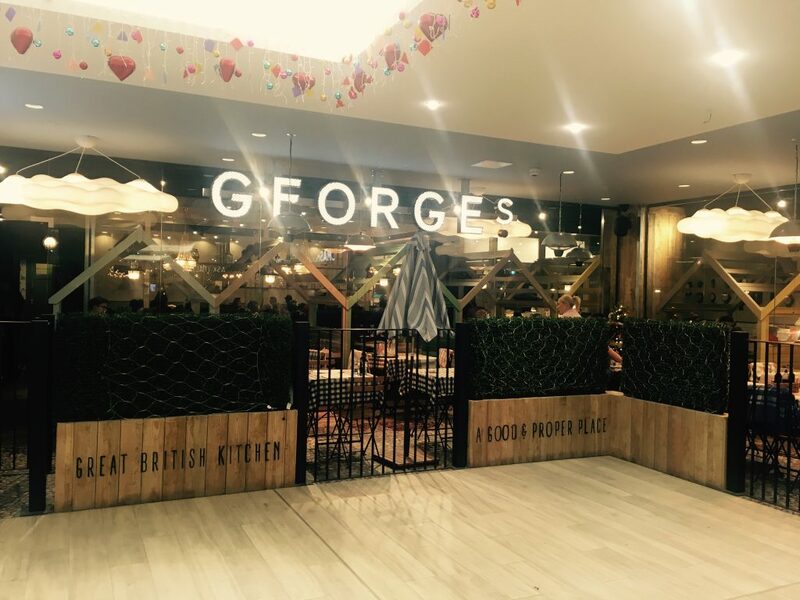 You can find George’s Great British Kitchen at Grey’s Quarter, Eldon Square, or check out their website for more information on the venue and what they have to offer! 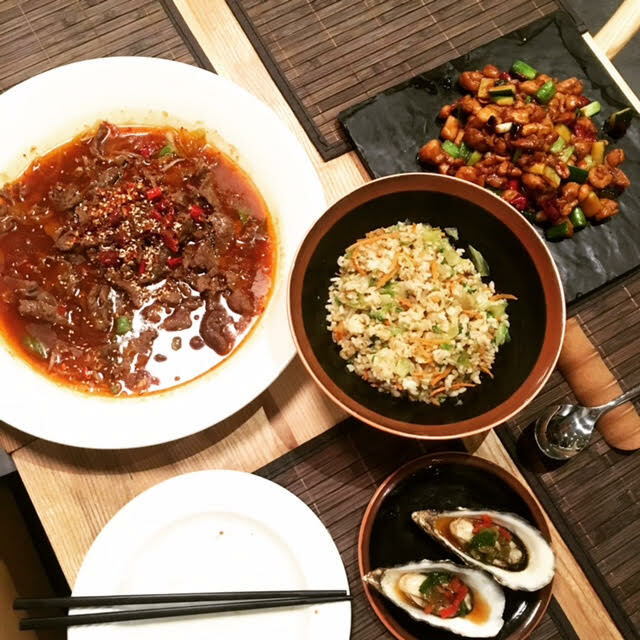 Previous Post La Yuan, Newcastle: Authentic Sichuan in the heart of the Toon! Next Post My Top 5 picks of Where to Eat this Newcastle Restaurant Week! Would be awesome to read one of your reviews where you didn’t get comped in some form. You know, like the rest of us. That and the fact that all your reviews seem overwhelmingly positive completely invalidates any integrity regardless of whether its genuine or not. Hi Matthew, thanks for your feedback. If you look through all of my reviews, you’ll see that many of them are uncomped. Regardless, however, the complimentary element does not have any impact on how positive the review is. If you’re in doubt of this, read my recent Marco Pierre White review. I always give constructive criticism and I visit many places on complimentary visits that don’t make it to the blog because the experience is not good enough. If you’d like to contact me further about my sponsored post policy, you can do so here.